The night we arrived in Tokyo, it was too late to go wander off to find food. Dropping off our bags at the small but luxuriously equipped hotel room, we went across the street where there were lots of restaurants and bars, and chose a place to grab something to eat. The 5 hour flight from Hong Kong left me and Rob starved! We walked around for about 10 minutes before we stumbled upon a restaurant that we wanted to eat at. This sounds much easier than it was. Not only did we have to find a place that looked it it had good food, we had to find a place that accomodated our language barrier too! Let me tell you, not all places were equally tourist friendly. Some places had pictures on menus, some had wax displays of the food in display cases outside, while others were text only. Utensils, condiments, napkins, and menus. o Shio Ramen: Has a transparent-yellow, salt based broth. Often served with thick straight noodles, chicken meat balls, and pickled plums. o Tonkotsu Ramen: Has a milky white broth that is stewed with pork bone, collagen, and fat on high heat for many hours. Often served with thin straight noodles. 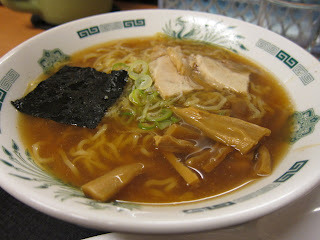 o Shoyu Ramen: has a brownish clear colour broth that is made from soya sauce. Often served with curly ramen noodles, bamboo shoots, bean sprouts, seaweed, and boiled eggs. o Miso Ramen: a soup base made with chicken/fish stock with lots of miso. This type of ramen is most often served with thick curly noodles, butter, and corn. Glad we got Ramen 101 out of the way. When the waiter came, we popped the first and most important question: do you speak english? The response was a weak attempt to communicate back to us in english, but we figured we'd just point and use our fingers to say how many. Luckily that did it, and we got our food very shortly after. The items that we ordered. Thank god for pictures and roman numeric numbers! The first thing we ordered was actually a beer. It's relatively affordable at only 420 yen for the large bottle. That's roughly $6. I love that Japanese beer is often lighter and milder tasting. So cold and refreshing! The dumplings don't look too appetizing but I don't think its appearance does it justice. They were so delicious! Crispy on the outside, and pipping hot juicy pork filling on the inside. What I like most about it, is that it tasted really homemade. Instead of tossing them in the deep fryer like a lot of thje gyozas in Toronto, these were pan fried. A little burnt I admit, but it didn't bother me too much. Based on the above description of the types of ramen, Shoyu ramen matches this picture to a T, so I'm going to assume this was what it was. It came with bamboo shoots, seaweed, a few peices of pork, and chives. The ramen is A-MA-ZING! I really wish there was something in Toronto that was this good. I could eat this all day long! The noodles are the perfect combination of bouncy and chewy, and the broth is really deeply flavoured. Not in a msg bad kinda way, but a "its legitimetly been stewed for hours" kind of way. The portions are quite small though. With my small appetite I easily finished the entire bowl and my share of dumplings. Its not like when we were in Taiwan! Luckily this was a midnight snack and not dinner. The distinctive milky white soup base along side the straight thin noodles definitely made this the Tonkotsu ramen. It came with seaweed, bamboo shoots, and a undercooked runny egg. I didn't like these noodles as much as the ones from the Shoyu ramen. They tasted exactly like vermicelli, and wasn't too special since you can get that everywhere in Toronto.. The soup base however was the real spotlight of this bowl. I liked it much more than the ramen soup. It had a nice hearty flavour, and a full bodied stock. On a side note, one thing I didn't like is that there is no such thing as non-smoking at restaurants. People commonly smoke in all places, and for a non-smoker like me, it was really irritating. Aside from that, it was a great experience sitting among a cloudy murmur of chatting locals while chowing down on some authentic ramen.